When interest rates are artificially low, nothing can stand in the way of stocks, it appears. Throw a partial government shutdown at the face of investors, which is seeing 800,000 employees baffled about their jobs and the S&P 500 rallies. Throw no progress for the China trade talks at them and the NASDAQ snaps back from bear market numbers into raging bull. Throw earnings misses from JP Morgan, FedEx, Apple, and other top names straight at them and the Dow Jones soars, regardless. Throw in major concerns about leverage in the corporate level and a slowdown in Europe and see how indices clear the jungle with machetes, climbing above their 50-DMA. Yet, perform a survey of top fund managers and get different results, altogether. They’re pessimistic. They expect weakness. 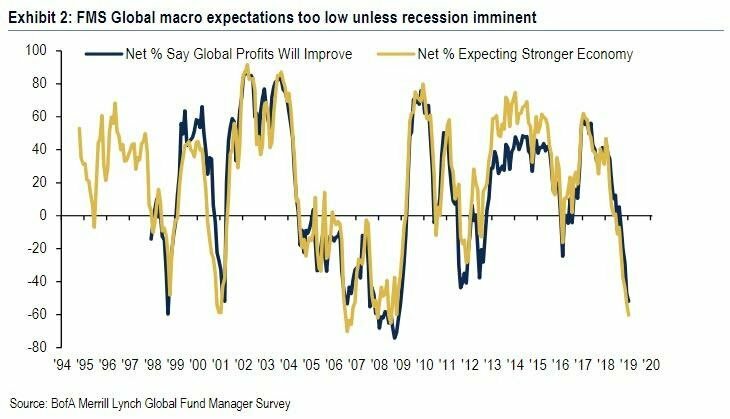 They, literally, expect a recession. But, as you can see in this chart, they expected in 1998 and instead they saw stocks go into 6th gear and make all-time highs. 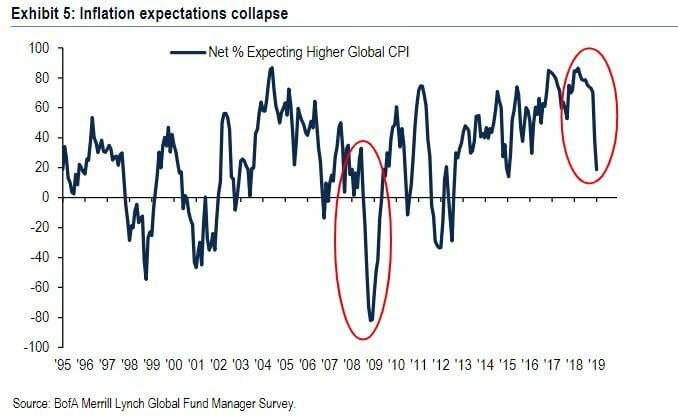 They forecasted a recession in 2006, reneged on that conviction by turning bullish in 2007, only to witness the most “brilliant” economists on the planet soil themselves, as the global financial system did a full-blown kamikaze on them. At three different occasions during this bull market, in 2011, 2013, and 2016, they envisioned End of the World scenarios falsely, as the economy kept churning upwards. They get it wrong more than they get it right. Most of the trading on an everyday basis on Wall Street is done by computers. They are programmed by humans. For them, a bear market is a 20% cut from all-time highs. On September 20, 2018, the S&P 500 topped. On December 24, 2018, it bottomed. The drop was a -19.8% move, just shy of around 20%. For algorithms, it means the difference between going nuclear and dumping shares or doing the reverse and buying the dip. That’s what they did. Markets are up; even in the face of overwhelming pessimism, a bull market climbs a wall of worry. Going over the data, more than half of U.S. stocks beat the large-cap, S&P 500 index during its -19.8% slam-down. Put differently, this smells like a steep correction, not a bear market. Here’s what gets investors confused, though: The NASDAQ did plunge into bear market territory, but its size is only a THIRD of the size of America’s 500 largest corporations, so the real barometer is the S&P 500 index. Here’s the most interesting phenomenon of all, however. It is that of inflationary expectations. Notice that is a CONTRARIAN indicator because when expectations have been high, precious metals underperformed. On the flip side, when no one is expecting it, and the graph is in a clear downtrend, gold makes its moves. This circled plunge tells us that policy-makers aren’t worried, which is precisely when silver is at its strongest. You don’t have to guess a person’s exact weight to know if they’re fat. This chart plots the way for precious metals, especially since the most crowded trade in the world right now is LONG dollar. To see gold $114 above its August lows, in the face of a strong USD, is a welcome change. 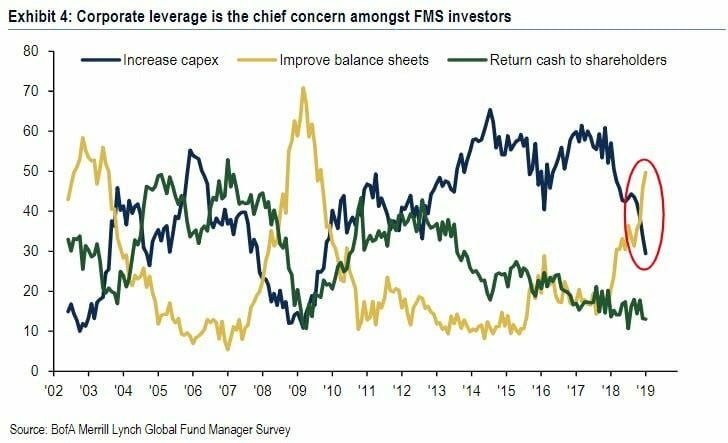 As you can see, when investors desperately want corporations to improve their balance sheet (yellow line on the rise), prices for equities are put under pressure, as they were in Q4, 2018. If CEOs change their tune, deleverage balance sheets, at the same time as politics improve with some positive news from the border wall debacle and the from Chinese trade talk efforts, and when investors get a clearer idea of how Europe’s woes are dealt with, a euphoric mania can persist in the second half of 2019. The fact is that investors are super-cautious, yet the floor isn’t dropping. Markets stay irrational longer than investors can stay stubborn in their opinions of what prices should be. The other part of the equation is the tremendous demographic trends in America. The Millennials generation is not what it was in the Obama years. Trauma from the 2008 recession has shaped their views of personal finance differently than their previous generations. They’re fighting an uphill battle to shed those student loan burdens from their lives, save more money to start their own families, and make better choices, in general. But up until now, the economy hasn’t provided them with many opportunities. The Trump administration’s focus on domestic strength in business has helped more Millennials enter the workforce than ever before. This generation’s conditions are improving by the second, yet all you hear about is that they’re frustrated and angry. When the sentiment towards 25% of the U.S. population is negative, when it should be positive, opportunities arise. I’ll have in-depth details on Sunday. In my view, the misunderstanding of Millennials trends has led to the false notion that Hillary was about to win the elections. It also has led to people’s surprise with the rise of Netflix and cryptocurrencies. The same investors, who doubted the strength of this generation, didn’t see social media’s rise to world fame, nor the historic legalization of cannabis. Millennials are now REVOLUTIONIZING yet another industry, disrupting it from the core. We will publish the full details this Sunday, as we’re compiling the most in-depth overview of this massive trend.